November 4, 2014 – Honeywell and NASA are celebrating 10 years of collaboration with FMA Live! Forces in Motion, an award-winning, hip-hop physics education program that inspires middle school students to learn and enjoy math and science in a compelling, fun and memorable way. 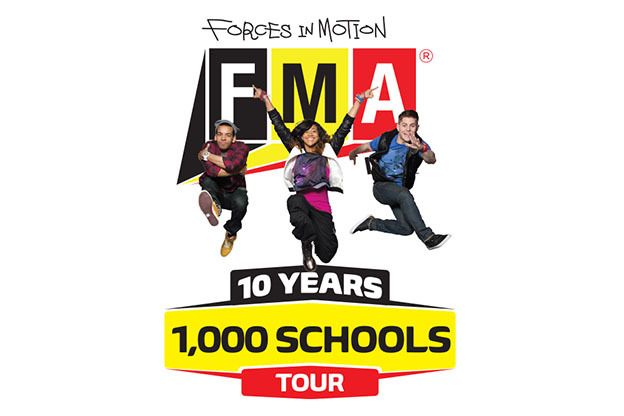 The popular show, which will visit its 1,000th school during this special tour, is in high demand, having been performed before 400,000 students in all 48 contiguous U.S. states, as well as in Mexico and Canada. The fall tour is rolling into Colorado Springs this week, hosting shows at four local schools, including: Janitell Junior High School, Fountain Middle School, Jenkins Middle School and Carson Middle School. Honeywell and NASA have joined to bring FMA Live! Forces in Motion to Colorado Springs as part of its continued commitment to provide STEM focused education assistance to students from military families. The Department of Defense Education Activity (DoDEA) has provided data to assist in identifying highly military impacted school districts for consideration for the scheduling of FMA Live! Forces in Motion, tours. This outreach impacts more than 2,300 students across schools, including middle schools from Widefield School District 3 and Fountain-Fort Carson School District 8. The physics-focused hip hop program serves to help reinforce the basic principles of STEM education subjects, a mission that complements DoDEA’s broader goals to continue to infuse science, technology, engineering and mathematics across all grade levels, curriculum and instruction. In recent world rankings from the National Science Board, the United States, which remains the world’s largest pool of scientists and engineers, lags in science and math performance with high school students showing below-average math skills and ranking 26th in the world. Over the course of 10 weeks, the show, under the direction of Honeywell Hometown Solutions, will reach 55 public, private and military-connected middle schools in seven west coast and southwest U.S. states, including: Seattle, WA; Portland, OR; San Francisco, Los Angeles and San Diego, CA; Phoenix and Tucson, AZ; Santa Fe, NM; Denver and Fort Carson, CO; and Salt Lake City, UT. The program will also be back on tour in the spring throughout the eastern part of the United States.